Barcelona is Spain's second largest city boasts wide, tree lined avenues, plenty of wonderful monuments and the Ramblas with its promenade stretching from the centre of the city to the waterfront. Since the Barcelona Olympics of 1992, Barcelona has emerged as one of the great cities of Europe. There is a cosmopolitan vibrancy that makes the place such fun to visit. In addition, the city is beautiful, boasts wonderful weather, has an array of excellent hotels and restaurants and has plentiful opportunities to party until the very early hours. The Circuit de Catalunya has had F1 racing since 1991 and is a modern, purpose built circuit half an hour from the centre of Barcelona. It offers excellent spectating with a variety of relatively inexpensive grandstand tickets and a lot of high speed corners. We have been looking after corporate clients, VIP guests and small groups for many years and our attention to detail is second to none. Barcelona offers a wonderful weekend to enjoy a vibrant city and enjoying one of the European races of the season. We know Barcelona superbly well and are therefore able to advise on the best hotels, the finest hospitality arrangements, the best parties, gala dinners and a wide range of day excursions such as dining at a private restaurant on a wine estate. We are able to provide a tour to match any requirements. Please call us for a bespoke quote. Over the last few years, The Ritz Carlton Arts has been the choice for those looking to stay in Barcelona during the Grand Prix. Indeed, many of the teams choose to stay here. Overlooking the Mediterranean from its unique position in the Olympic Village next to the marina, the 5 star Hotel Arts Barcelona embodies the rich history and spirit of Spain's foremost Catalan city. Its striking silhouette has made the hotel a symbolic building of the new Barcelona. The hotel has 455 guest rooms and lies within easy reach of beaches, promenades and a host of excellent restaurants and bars. The Grand Marina Hotel is luxury hotel located in the Old Port of Barcelona. This 5 star property offers magnificent views of the famous Ramblas, Maremagnum Complex and the magical Gothic Quarter from all eight of its floors. All of this hotel's guest rooms are well appointed and feature luxurious bathrooms and upscale amenities. The décor of the guest rooms is very contemporary and elegant. 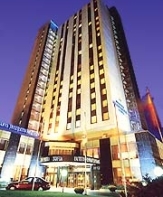 The Princesa Sofia is a 4 star hotel located on Avenida Diagonal, a block from the Palau Reial (Royal Palace), two blocks from Camp Nou football stadium, and approximately two miles from the Gothic Quarter. All guestrooms are well equipped featuring leather-topped desks, high-speed Internet access, pay movies and an in-room massage service. The metro stop Maria Cristina is a 3 minute walk and from there you can get straight into the centre of Barcelona in 20 minutes. Our Gold Hospitality is located on the 1st floor of the main grandstand, just opposite the pit lane, the pit garages and the main straight of the track. The Spanish Grand Prix is one of the fastest straights in F1 and upper seats in the Main Grandstand provide an exceptional view of the main straight allowing you to see and hear the cars performing at their highest limits. Located opposite the Pit Lane, you will be ideally placed to see all of the pre-race action and the on the grid preparation. Additionally, you can also view the podium, the garages and the Pit Lane. 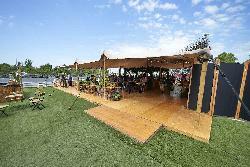 The Village Silver Hospitality option offers an option between standard grandstand seating and the corporate suites. 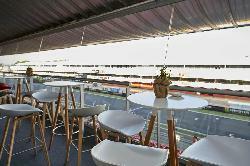 With this access, guests will be able to enjoy the race from a reserved seat in covered Grandstand I. Located on the final turn of the circuit, guests will be seated in front of the pit entry and will be able to view the action as the cars enter the main straight. With a large menu of delicious foods on offer throughout the day, there will be plenty to enjoy around the dining area as well. In the morning guests will be provided with a breakfast comprising of everything from mini pastries to coffees and shakes. From midday, a selection of salads, rice dishes, barbecue meats and Mediterranean cuisine will be on offer on the buffet followed by tempting desserts. An open bar will be available throughout the day between 09:00 and 17:00 on Saturday and Sunday where beer, wine, soft drinks, mineral water, coffees, tea, fruit juices and shakes will be found. Also, the Barcelona AMBER LOUNGE has arrived - the best F1 party in town! We can offer helicopter shuttles from the centre of Barcelona all the way into the Catalunya circuit. The AS350 aircraft hold 5 passengers and are also available from Girona. Helicopters only available to those who book a travel package or hospitality with us.